Wow this is amazing insight from these two guys! That's a great interview. I wish they would have had more time to let them go more in depth, though. I'm still convinced they won the cup that day. Should be a state holiday. Bloody yes! 301 days after the hit on Draper; 73 days before V-H Day (Victory-Hockeytown). If ever an entire franchise had a "turning point", that was it. Remember Mitch Albom playing Debbie Downer decrying all the blood and violence? I do. Fortunately Wojo made up for it. He was drinking up the bloodshed and with the words he penned was all but spraying it upwards in a celebratory blood fountain. That was Mitch setting the stage for his Oprah-ification. Not sure if his Tuesdays book came out yet but that was a turning point in how I viewed his work. Showed me that after living here for a decade he still didn't get Detroit. It is interesting how that night changed the perception. Before that game there was a lot of doubt about the team still. The Avs won the Presidents that year, didn't they? Vernon was distant and a bit of an outcast. Was out of town and out of touch all weekend, but even 1 day late I must acknowledge as we do every year this glorious, which was really the Wings' first "post-season" game of the 1996-1997 Cup year. The Avs were well on their way to the President's trophy, had beaten the Wings soundly the 3 previous times they played that year, and the Red Wings were merely a good team that had years of play-off disappointment that I think most assumed were likely to peter out without a cup given the youth and talent the Avs represented. I'd also add that I'm not sure that game changed perception until AFTER the wings won the cup. I don't think the Wings were favored to beat the Avs going into the play-offs, or were viewed as anything but a dark horse team. I'm not even sure they were favored to win the cup once they beat the Avs and faced the Flyers. But my memory is poor in general. Vernon had a poor regular season, and frankly played poorly that game. He allowed 5 goals on 16 shots, IIRC, and a couple to Kaminsky that were absolute softies. The Wings only had 94 points in 1997. Apart from 93 points in 1999, that is the Wings' lowest regular-season total of any full season between 1992 (98 points) and 2011 (97 points and counting). This would be the case even if you excluded shootout points in the post-lockout years. What I meant, but didn't express teh right way, was not after that game at the time, but in retrospect, the pundits and fans act like that was some big turning point. Maybe it was internally, but I suspect it just plays well as a narrative. On that same token I was mention the Roy Statue of Liberty play in 2002. If he doesn't showboat perhaps that series goes the other way? Then how would that loaded 2002 team have been perceived? Bowman's a genius for being able to manage all those HOF'ers but if Roy doesn't do that and the Avs win the series, he turns into an aging doofus who was past his prime! I dont' think the Wings were the favorites against Philly. I think it was much like the 1995 Finals where the Wings were expected to just roll over the Devils. That week, with Memorial Day being when they beat Colorado, until that Saturday when they won the cup was one of the greatest sports weeks in my life. Probably only topped by teh Tigers in 2006. This is my take as well. It was a emotional game that went their way, and fits a narrative really well. That isn't to say they got nothing out of the game, or anything like that, but had they merely tied the game, or even lost in OT, I still think they win the Stanley Cup. The Red Wings, to me, illustrate as well as any team, how, for want of a better word, fickle the play-offs can be. Since the early 90's, the Red Wings have been at least a dark horse candidate, if not a good candidate, if not THE candidate to win the Stanley Cup. For 20 years straight they have had a legitimate shot to win the whole ball of wax. That's over half my life. And they have only won it 4 times, reaching the Finals on 2 other occations. Yet they are regarded (rightfully, IMO) as the most successful NHL franchise in hockey over that time-frame. Nobody credible (I think) seriously thinks they have underachieved or have been a failure. This is a good take on it. 62 wins (131pts) in 1996 - Lose in Conference final. Shanny's goal on Roy is one of those turning points people always talk about, as is the Lidstrom goal from center on Cloutier. Detroit was down 2-1 to Vancouver, Lids buries from inside the red line before the end of the period, and boom.. the Wings roll on. But what if this didnt go in? Do the Wings still take that series over? Chances are they still win it. These events look great in hindsight after the team is successful. - what if the Wings had closed out the Leafs, a team that finished below them in the standings, in Game 7 of the opening round in '93, when the Wings had the Leafs just 2 1/2 minutes away from elimination. The Leafs ended up going to Game 7 of the WCF that year - would the Wngs have gone as far or farther? Borschevsky is still my hockey Bucky Dent. - what if the Flyers had knocked off the Devils in the '95 ECF - would the Wings have matched up better with Philly than NJ? - in '97, what if the Wings hadn't got on the board late in the 2nd period of Game 2 of the WCF against Colorado on a fluke goal off of Foote's skate when the Wings were down 1-0 in the series and 2-0 in the game? - in '98, what if either of the long goals on Osgood in each of the first 3 rounds led to a series loss - would that have ended Ozzie's Detroit career? - in '06, what if a weak Oilers team hadn't won Game 3 n OT after the Wings (124 pt regular season) had earlier had an apparent game-winning OT waved off. Or if the Oilers hadn't scored a controversial goal with 4 minutes to go in the 3rd to tie Game 6, in a game they won moments later to eliminate the Wings. In all 4 Cup years of '97, '98, '02, and '08 the Wings were tied 2-2 in games in the 1st round. If the Wings had been able to get by the Oilers the same way they would have had a relatively clear path to the SCF due to all the early upsets. - in '07, what if the Wings had hung on when up a goal in the final minute of Game 5 at home versus Anaheim in the WCF in a game they had thoroughly outplayed the Ducks with the series tied 2-2? - in '09, what if the Wings hadnt given up a shorthanded goal to Pittsburgh in Pittsburgh when up in the series and up in the game early in the 2nd period in the SCF? Philly was supposed to win in 4 or 5 games. I always thought that game was a turning point. I thought on March 26th they became a complete team. The fans got totally behind Vernon for the first time and lets not forget they erased a two goal deficit to win in OT and it was McCarty that scored that. 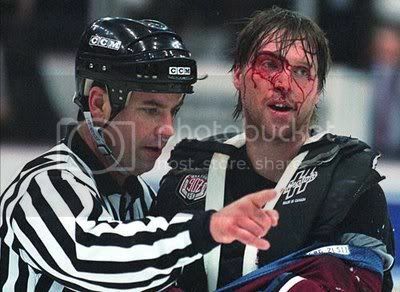 McCarty owned Roy and I think part of it was because of that fight. The fans got totally behind Vernon for the first time and lets not forget they erased a two goal deficit to win in OT and it was McCarty that scored that. I think fans found a newfound respect for Vernon for fighting Roy, but I really don't think fans got totally behind Mike until he started posting excellent play-off numbers in '97. I doubt anyone posting here forgot the Wings were down 2 goals in the third and won on a McCarty goal in OT. 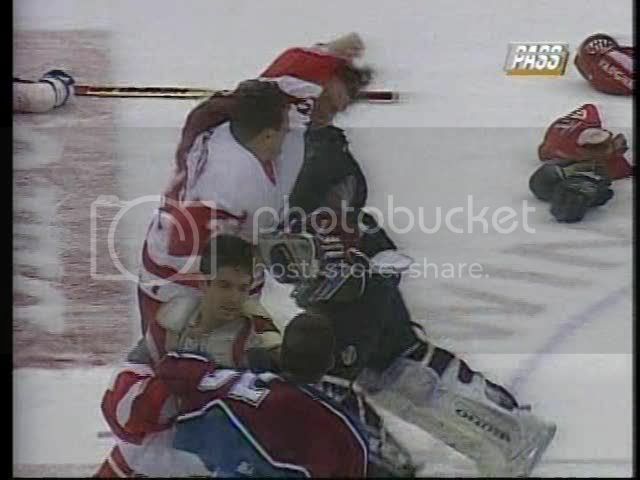 I don't think McCarty owned Roy, and even if he did, I doubt it was in part because he fought Claude Lemuiex. Was that really the sentiment back then? 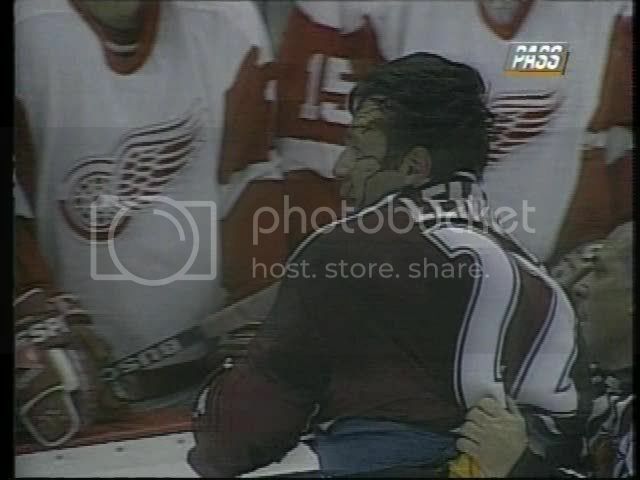 I remember the Wings being the decided underdogs going into the Colorado series, but by the time they dispatched of the Avs I seem to recall the Wings being given at least a 50/50 chance to beat the Flyers. My recollection is Philly was favored because they had the home ice advantage and it was thought by a fair percentage of commentators that the Legion of Doom line would physically dominate the Wing's top line, but I don't know if most people thought it would only take the Flyers 4 or 5 games to win. If anyone is going to be in the Mt. Clemens area on Saturday, April 2nd, you can go to the Gibraltar Trade Center & get both McCarty's and Lemieux's autographs.